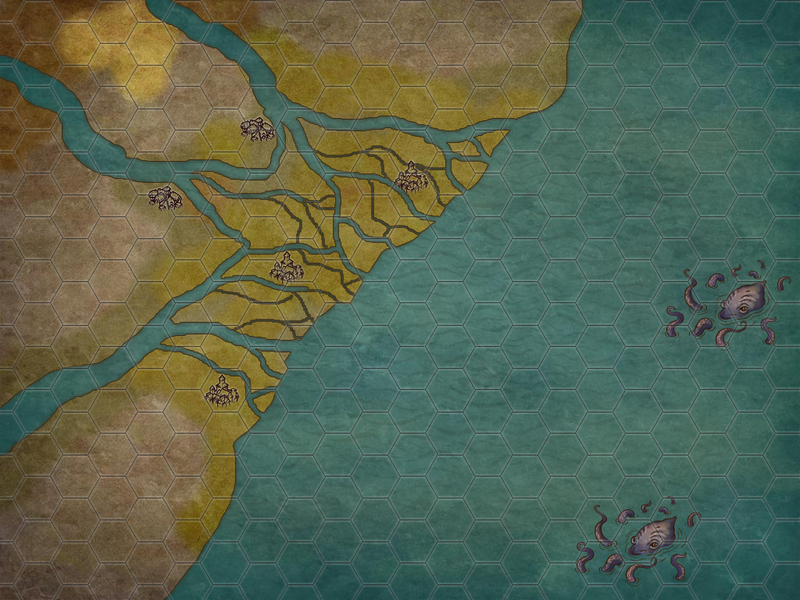 The Teuthiliad live inland from the coast itself; in settlements lifted into the trees and away from the largest of the delta's waterways where the danger is greatest. These small settlements make a living fishing in the deepest of rivers and offshore in the oceans. The largest of settlements put together glory hunting crews to go further offshore to fish the depths of the abyssal trenches that plunge into the blackness. These trenches begin just offshore and extend outwards in networks of darkness into the deeper oceans. None of the Teuthiliad know just how far they extend. In the depths, the largest and fiercest of sharks and beasts live, and aside from the glory of bringing one of these monsters to feed their people, the Deep Hunters also strive to hook and haul in one of the monstrous kraken which live in the deepest reaches of the trenches. These tentacle wreathed monsters would feed a settlement for days and provide all manner of unusual organs and fluids that can be used by the Teuthiliad mystics to power their craft. Further inland, and considerably safer from the fiercest of sea beasts that life off the Shattered Coast, can be found the towns of the Wader-Folk. These towns ply a trade along the wider rivers and make a living trading, fishing and hunting amongst the reeds and shallows of the three Sister Rivers. the more skilled of them take on a more sacred role; donning lengthier waders and traversing the deeper of rivers to pluck from them the corpses of the dead which have washed downstream from battlefields nearer the continents's heart. To the Wader-Folk, these magic-tainted bodies cannot reach the delta proper, let alone the oceans. The corpses are bloated with more than just rot-gas and if they were to become a feast for the creatures living in the swampy darkness, then Sigmar alone knows what havoc the twisted beasts might wreak. The possibility of these bodies reaching the Queen of Reeds however is too terrifying to even consider; most Wader-Folk would prefer a return to the time of the Mud Sharks than see the Queen rise again.